Joy Harjo is a poet, writer, performer, playwright, and saxophone player. She was born in Tulsa, Oklahoma, in 1951 and is a member of the Mvskoke/Creek Nation. She came to New Mexico to attend the Institute of American Indian Arts, where she studied painting and theater. Later she received her undergraduate degree from the University of New Mexico, followed by an MFA from the University of Iowa. 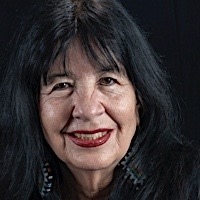 The author of more than 10 poetry collections, she began writing poetry "when the national Indian political climate demanded singers and speakers." She was taken by the intensity and beauty possible in the craft. Her books include How We Became Human: New and Selected Poems 1975-2002 and She Had Some Horses, first published in 1983, with a second edition in 2008. Her newest collection, Conflict Resolution for Holy Beings (2015), was hailed by Yusef Komunyakaa as "a marvelous instrument that veins through a dark lode of American history." Her memoir Crazy Brave (2013) is rooted in tribal myth and ancestry. In it she writes, "East is how the plants, animals, and other beings orient themselves for beginnings, to open and blossom. The spirit of the day emerges from the sunrise point. East is also the direction of Oklahoma, where I was born, the direction of the Creek Nation." In addition to her writing, Harjo has produced musical recordings and has performed internationally, from the Arctic Circle in Norway at the Riddu Riddu Festival to Madras, India, to the Ford Theater in Los Angeles. Harjo is a professor and the Chair of Excellence in the Department of English at the University of Tennessee at Knoxville.